We are delighted to invite you all to participate in the 4th edition of the International Primary Immunodeficiencies Congress – IPIC2019 – which will be held in the lively city of Madrid, Spain, on 6-8 November 2019. After venturing successfully for the first time outside Europe in Dubai in 2017, we are excited to be back in Europe with a 2019 edition that will build on our previous event and promises to deliver a diverse and stimulating scientific programme focusing on the state of the art in primary immunodeficiencies (PID) diagnosis and clinical care. In 2017, over 90% of clinicians applying for CME accreditation had indicated that they will implement what they learned at the congress in their clinical practise. 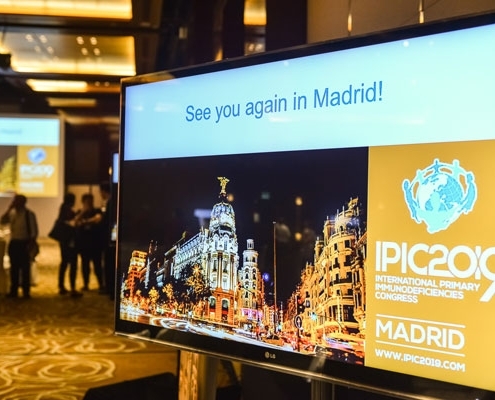 IPIC2019 will aim to achieve the same goal and even more, by providing a well-balanced and appealing scientific programme is clinically orientated and prepared with the input from the key PID stakeholders: doctors, patients and nurses. The congress programme will feature world-renowned experts in the field of PID as well as other key stakeholders who will share their invaluable experience and their unique perspectives on major clinical developments and advances in the field. IPIC2019 will be held at the Marriott Auditorium Hotel. Conveniently located close to Madrid Barajas international airport and with easy access to Madrid’s city centre, the hotel boasts its own conference centre and auditorium whilst offering all the professional facilities and the comfort of an international business hotel. Madrid is the capital city of Spain, the third largest city in the European Union as well as the political and cultural centre of the country. It offers a myriad of cultural attractions and activities and is often described as the ‘real city that never sleeps’. Madrid Barajas international airport is also the largest airport in Europe and one of its busiest offering excellent connections to all world regions. Madrid enjoys an amazing temperate climate in Autumn and November is described as a great month to visit, making this great cosmopolitan city an even more ideal venue for the congress. We look forward to welcoming you all in Madrid!